The Minnesota man carved his and his wife’s names next to the 1806 signature of explorer William Clark, of Lewis & Clark. BILLINGS, Mont. — A Minnesota man who carved the names of himself and his wife near the 1806 signature of explorer William Clark on a national monument in Montana has agreed to pay $4,400 in restitution and fines, the Bureau of Land Management said Monday. 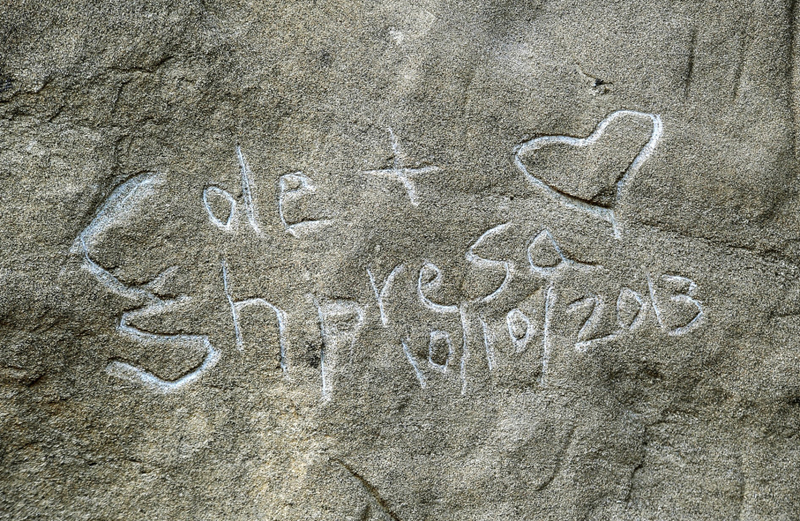 The fine came after the U.S. attorney’s office filed a misdemeanor vandalism charge against Cole Randall of Plymouth, Minn., for the carving in sandstone at Pompey’s Pillar that reads “Cole + Shpresa 10/10/2013.” The carving also included a heart. Randall’s carving — made just a few feet to the left of the “W. Clark” signature made in July 1806 — also impacted other, more faded historical signatures, some of which were over 100 years old, Kitchens said. Randall has said he made the carving after his wife discovered a lump in her breast during their honeymoon. He said he was inspired during their stop at the monument by a description that said generations of Americans passing by had left their marks on the rocks, and that he decided to leave the couple’s name in case anything happened to her.